Today in the Bloch Building at the Nelson-Atkins Museum of Art (Kansas City, Missouri), I saw The Raft by Bill Viola, a 10 and a half minute video. The Raft begins with a diverse group of people waiting, as if for a bus. The group is a mixture of ages and races, both men and women as well as a transgender person. Filmed at high speed and played in slow motion, each gesture – a yawn, riffling through a purse – becomes dance-like and surreal. For the first part of the video, there is very little interaction among the group members. Some enter to wait with the others, while those already in place wait with bored expressions. Eventually one white-haired man pushes through the crowd to place himself front and center, earning disgusted looks. Later, a woman in a sari weaves gently through the group to greet a friend. In the midst of this one friendly gesture, torrents of water suddenly hit the group. They struggle against the deluge as all signifiers of race, age and life situation are erased in the face of their mutual conflict. The water obscures most of the figures, but some break through with dramatic and occasionally heroic motions. When the water recedes, the group is disheveled, some lay on the ground, many are on their knees. Women who at first didn’t even give each other a second glance are suddenly embracing and weeping. A young man reaches to check on the elderly woman who fell, and another on an elderly man. 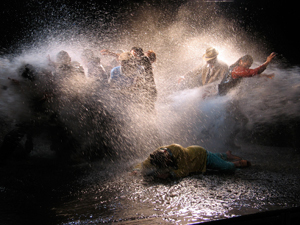 Bill Viola stated that this video is a “metaphor for today’s world,” in which we are strangers, perhaps close by physical proximity but psychologically separate until drawn together by unexpected disaster. The Raft also is a reference to a painting by Theodore Gericault, The Raft of the Medusa. This iconic painting shows several people on a raft, struggling to stay alive after a shipwreck. It is referenced physically by the agitated group of people after the deluge has retreated as well as in the title of the work. I found the video captivating. It was intriguing how even the smallest movements of the individuals held huge drama because of how they were captured. I also loved how Viola brought the imagery of The Raft of the Medusa into the contemporary art dialogue by his reference, updating the tragedy and terror of that painting with living, breathing characters. The Raft can be viewed at the Nelson-Atkins Museum of Art through April 29, 2012.